Biosphere: The global sum of all ecosystems. It can be termed the zone of life on Earth, a closed system (apart from solar and cosmic radiation and heat from the interior of the Earth), and largely self-regulating. By the most general biophysiological definition, the biosphere is the global ecological system integrating all living beings and their relationships, including their interaction with the elements of the lithosphere, geosphere, hydrosphere, and atmosphere. The SeaWiFS instrument was launched by Orbital Sciences Corporation on the OrbView-2 (a.k.a. SeaStar) satellite in August 1997, and collected data from September 1997 until the end of mission in December 2010. SeaWiFS had 8 spectral bands from 412 to 865 nm. It collected global data at 4 km resolution, and local data (limited onboard storage and direct broadcast) at 1 km. The mission and sensor were optimized for ocean color measurements, with a local noon (descending) equator crossing time orbit, fore-and-aft tilt capability, full dynamic range, and low polarization sensitivity. The SeaWiFS instrument aboard the SeaStar satellite has been collecting ocean data since 1997. By monitoring the color of reflected light via satellite, scientists can determine how successfully plant life is photosynthesizing. A measurement of photosynthesis is essentially a measurement of successful growth, and growth means successful use of ambient carbon. This animation represents nearly a decade's worth of data taken by the SeaWiFS instrument, showing the abundance of life in the sea and along the Western seaboard of the United States. Dark blue represents warmer areas where there is little life due to lack of nutrients, and greens and reds represent cooler nutrient-rich areas. The nutrient-rich areas include coastal regions where cold water rises from the sea floor bringing nutrients along and areas at the mouths of rivers where the rivers have brought nutrients into the ocean from the land. 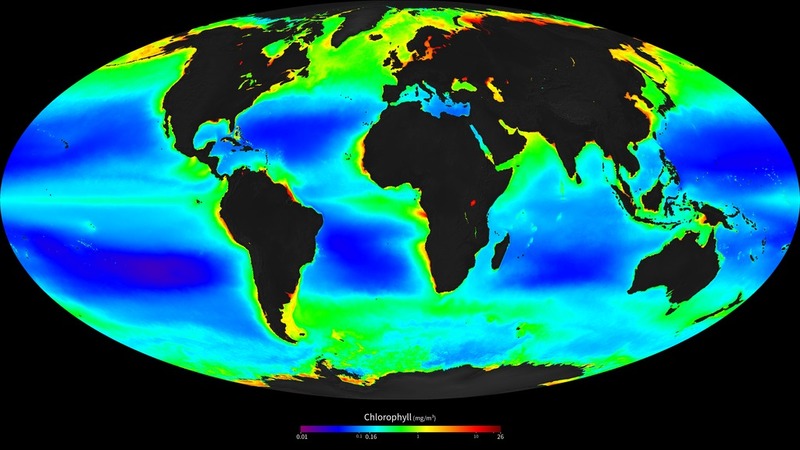 The nutrient-rich waters contribute to some of the oxygen-poor pockets of the seas called dead zones. This page was last modified on 12 April 2019, at 18:41.